During Paul Graham’s office hours at Disrupt NYC, one of the startups chosen to pitch to the Y Combinator co-founder was Emotely, a company that converts your smartphone into a wireless controller of web apps and games. Emotely Founder and CEO Francois Laberge was nowhere to be found, at which point TechCrunch’s Mike Arrington said that he remembered liking Emotely and that it was too bad, because he was “looking forward to hearing [Graham] give him advice”. It was indeed a missed opportunity, but it turns out that Laberge had a good reason for not attending. We’ve since learned that Laberge and Emotely were busy being acquired by Brass Monkey, a company that makes software development kits (SDKs) for Android, iOS, and others, among them a more fleshed-out kit for turning smart devices into controllers. Though the two companies are not yet sharing the full terms of the deal, it is clear that Laberge will be joining Brass Monkey as a member of the board as well as chief innovation officer, in which he will head the startup’s business strategy and HTML5 and mobile technology. The aqui-hire is a great fit for the two companies. Because Brass Monkey has a more fully developed controller-building SDK, with support for Flash, Unity3D, and desktop games and apps, Emotely’s ability to build controllers using HTML5 for both the interface and communication layer (with HTTP and WebSockets) provides a killer complement. It essentially allows Brass Monkey controllers to hit web browsers without the need for a plug-in. So what is this “Emotely” I keep going on about? The startup provides a technology that enables mobile apps to communicate with webpages without requiring installation or setup on a user’s computer. Laberge said that the app communicates at over 150hz, meaning that actions performed on the smartphone are sent to webpages in 1/150th of a second, 2.5 times faster than human perception of movement. Which means there’s little perceptible lag time between the phone and your computer. While Emotely does require a user to have their phone on the same LAN connection as your computer, most people already have their phones and tablets on WiFi when they’re at home. Within the app, users can then choose from a series of controllers, some requiring payment and some free. And since Emotely is built on top of an SDK, users and developers can build their own controllers — and because Emotely’s controllers are webpages, anyone with basic skills can create and register them on the site to then appear in the app. So, if you’ve got a controller setup you like more than the ones Emotely offers, you can create your own. Pretty cool. Emotely was designed to make Nintendo Wii-style multiplayer games, in which multiple gamers can play while sharing a screen. By linking a computer to a TV, users can play web games from the comfort of their couch, and since consoles like PS3 and Nintendo Wii employ browsers, it seems that Emotely is Trojan Horse-ing its way right into your living room experience, placing it in a great position to help speed the convergence of computers and TVs. “Emotely adds HTML5 support at a time when web-based games are revolutionizing the gaming industry”, said Brass Monkey President and CTO Chris Allen, “Flash is no longer the only choice for creating sophisticated experiences that run in a web browser. Allowing developers to choose HTML5 as an endpoint broadens our reach tremendously”. 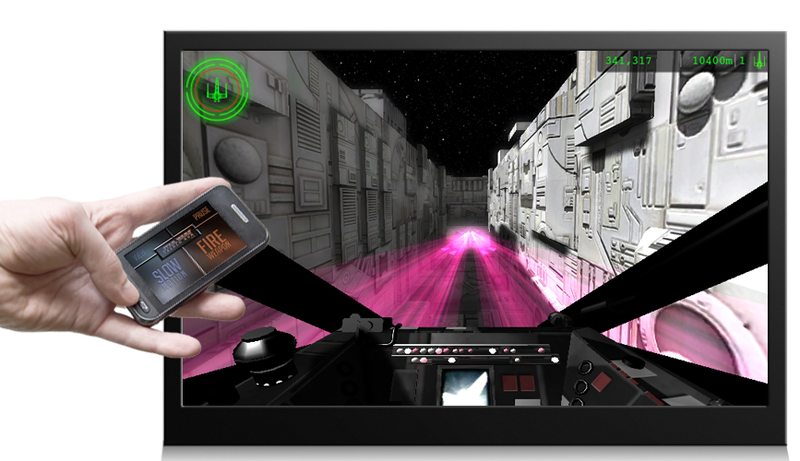 Considering that Emotely includes controllers for games, playing movies, music, collaborative drawing apps, and slideshows that utilize all the features of modern smartphones, like multi-touch, motion controls, geo-location, in-app purchasing, and cameras, the final product produced by the two companies has the potential to be a disruptive force for gameplay and development. It’s some exciting stuff.